For the production of ATP through oxidative phosphorylation electrons are required so that they can pass down the electron transport. The electrons required for oxidative phosphorylation come from electro carries such as NADH and FADH₂ which are produced from the Tricarboxylic Acid Cycle (TCA cycle). 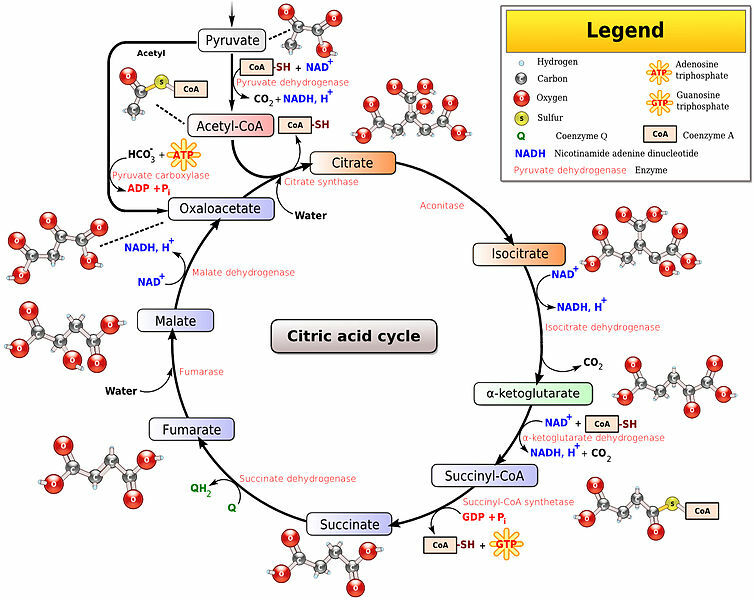 In this article we will discuss the TCA cycle (also known as Kreb’s cycle). The TCA cycle is a central pathway into which many metabolites feed. It consists of a number of reactions which generate NADH and FADH₂ which can in turn be used by the oxidative phosphorylation pathway to generate ATP. The TCA cycle occurs in the matrix of the mitochondria. Step 1: First the acetyl CoA (a two carbon molecule) joins with oxaloacetate (4 carbon molecule) to form citrate (6 carbon molecule). Step 3: Isocitrate is then oxidised to alpha-ketoglutarate (a five carbon molecule) which results in the release of carbon dioxide. One NADH molecule is also formed in this step. The enzyme responsible for catalysing this step is isocitrate dehydrogenase. This is a rate limiting step as isocitrate dehydrogenase is an allosterically controlled enzyme. Step 4: Here alpha-ketoglutarate is oxidised to form a 4 carbon molecule which picks up coenzyme A forming succinyl CoA. This conversion also forms a NADH molecule. Step 5: Succinyl CoA is then converted to succinate (4 carbon molecule) and one GTP molecule is produced. Step 6: Succinate is converted into fumarate (4 carbon molecule) and a molecule of FADH₂ is produced. Step 7: Fumarate is converted to malate (another 4 carbon molecule). Step 8: Malate is then converted into oxaloacetate and NADH is also produced here. Fig 1 – Diagram showing the steps of the TCA cycle. It is important to be aware that whilst the primary role of the TCA cycle is production of NADH and FADH₂ it also produces molecules that supply various biosynthetic processes, which can enter or exit the cycle at various points depending on the demand on different reactions. For example, alpha-ketoglutarate can leave the cycle to be converted into amino acids or succinate can be converted to haem. Each cycle produces two molecules of carbon dioxide, three molecules of NADH, three hydrogen ions, one molecule of FADH₂ and one molecule of GTP. As such each molecule of glucose produces double this (2 carbon dioxide, 6 NADH, 6 hydrogen ions, 2 FADH₂ and 2 GTP). The TCA Cycle is regulated in a variety of ways. As already mentioned isocitrate dehydrogenase regulates step 3 of the TCA cycle, making it the rate limiting step of the cycle. In addition to this energy availability also regulates the cycle – so low energy signals, such as ADP activate the cycle and high levels of NADH (a product of the cycle) inhibit it. The most important thing to note is that there are in fact no known defects of the TCA cycle that are compatible with life. This highlights the importance of this step in ATP production for sustaining life. How many molecules of CO2 are produced per TCA cycle? How many molecules of NADH are produced per TCA cycle? How many molecules of FADH2 are produced per TCA cycle? How many molecules of GTP are produced per TCA cycle? Which enzyme regulates the rate limiting step of the TCA cycle?